In this day and age of the digital economy a small gift still can do much, even more so when it is personalised. 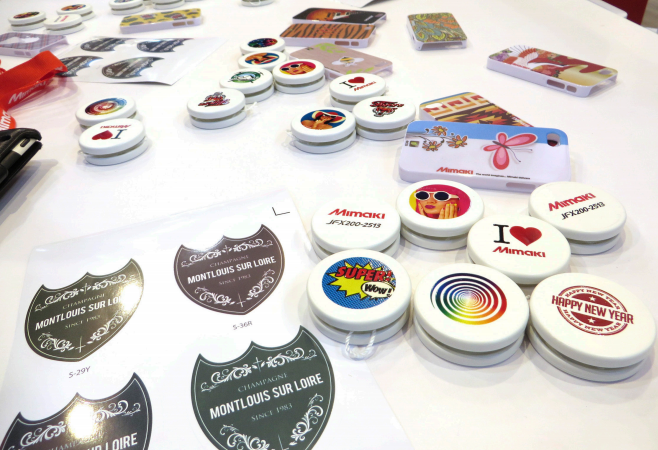 Inkjet is the perfect technology to print directly onto even round or irregular shaped items with no mould required. A flyer is thrown away in a fraction of a second. Online display advertising gets clicked away before it even builds up fully on the screen, so what can designers and marketeers do to reach their audience? Latest research papers suggest that multisensory objects achieve huge response rates. As it happens, there are three main ways for the average customer to get in contact with objects attracting more than one of his or her senses at the same time: as a personal or promotional gift, and with packaging. Basically “multi-sensory” means anything that a person can not only see, but also hold and touch, maybe even hear or taste. Bear this in mind and never wonder again why nobody seems to bother with lighters or ball-pens these days. In their small promotional gift stash, those items never make it to the end of day one at any event. Inkjet is a contactless printing technology available for a wide variety of inks. Thus, it has taken over many applications that were previously pad or screen printed. Unlike analogue printing technology, inkjet does not require any form or mould, which means that putting a logo onto a flash drive is just as easy as printing a logo and customer’s name or picture onto it. There are not many other ways for brand owners to get this close-up and personal with their customers! Inkjet in fact has a long tradition with promotional and personal gifts, garments, shoes, cutlery, mugs and many other things, using a sublimation process. In a nutshell this means to print onto paper and transfer the water-based ink onto virtually any polyester or polyester-coated surface with the help of a high temperature press. Today’s direct-to-object (DTO) inkjet technology is faster, because the time-consuming pre-coating and transfer finishing processes are no longer required. Most DTO inkjet applications rely onto UV curing ink, as a strong UV lamp will cure the drop within a very small timeframe. UV-curing ink will stick to virtually any uncoated surface with very high printing quality and accuracy. While most UV-curing inks wide format inkjet flatbed printers are used for rigid media such as boards, major printer manufacturers like EFI, Fujifilm, Mimaki and Roland have long realised, that UV-printing directly onto small objects is also a very lucrative niche. Thus, they allow for material thicknesses of 45 mm or more with certain models. In this way, for directto-object printing many small items can be placed into custom-built wide-format grids and easily processed in a batch. For smaller batches, or when wide format printing is not required, Mimaki also offers desktop-sized UJF series models dedicated to promotional gift printing only. Roland DG, with its Versa UV LEF-Series has similar products in its portfolio. To not destroy the printheads (and the print), they must never touch the object. This can prove to be a problem with very irregular shaped pieces. Also, the head-to-substrate distance for high quality prints is very much fixed. When the head is too far away, the colours get blurry. With a corrugated or multi-level surface, depending the result you want, any height difference bigger that about one centimetre will probably not work at all, as the ink drops cannot be placed correctly. Make sure to always order a proof print on the intended surface in the preparatory phase so that you can tweak the design or substrate as needed. The UV inks used in the batch printing DTO process most often are the same as a printer would use for outdoor graphics. This might not be problem when printing onto a cosmetic bag, but much more so with a mug, or anything that is intended for food or kids. But there are some low migration UV-curing inks, mainly for packaging applications (we will come back to that later). To make sure to not design a gift that harms the customer, the necessary certifications for the inks should be specified early on in the process. There are some inkjet inks that are even edible: the food industry has been working with water based, foodsafe inks for years. They are widely used for printing onto almond paste that will decorate cakes and pastries. But there also are custom-made or modified models that print directly onto cookies. Packaging is another segment where haptic is an important part of the consumer experience. For large batches of goods, many innovative solutions to many a printing problem have been found. But with its promise of formless high quality full colour printing, inkjet makes it possible to produce small batches of cans or tubes. The option has been embraced mainly by the craft beverages and food industry, where small quantities of local and/or high-end products still need professional packaging, but analogue print run length is just not feasible. To offer a cost-effective tubes and cylindrical objects printing option, Mimaki has introduced “Kebab” style inkjet printing option for their UJF series. A headstock moves the cylindrical piece in front of an array of inkjet heads. With the distance between substrate and printing head constant, high-quality printing even of very small fonts is perfectly feasible. Mimaki are suggesting to print not only packaging tubes, but also vases or candles with this technology. Personalized packaging may require a bit more productivity, though. There are dedicated direct-to-can printing options available, as well as direct-to-shape (DTS) printers that can be programmed to move the printhead safely over very difficult irregular surfaces. Those industry options usually come with an ink certified for the task, eg. low migration for primary packaging. My Muesli, a German manufacturer of customized cereals, in 2015 installed a DTS printer in their Heidelberg flagship store to offer a personalized cardboard tube box for their muesli. Industrial grade inkjet DTO/DTS solutions may however, still require relatively large quantities, as programming and finishing are time-consuming. Depending on the application, digitally printed shrink foil or even flat corrugated board that is cut with an automated Esko cutting table and assembled or folded into a box or another object may prove an alternative. Help! My Customer wants me to DTO. What do I do now? Relax. And make sure you understand, what exactly he or she is asking you to do: Do they want a gift or industrial good personalised? Are they looking into a unique promotional item? Do they require small batches or personal packaging? There are inkjet DTO solutions fine-tuned for each of those applications. But they need to be carefully designed and specified from an early stage: numbers, requirements, certifications … Do talk to a qualified printing house, but also to an expert in the line of business the item will be targeting. Remember there are safety regulations for almost all industrials good, and those apply to personalised as well as mass production. Then just go wild, be creative. Have fun! The Wild Format guides are intended to expand awareness and understanding of the craziness that can be created on wide format digital printing devices, from floors to lampshades and everything in between.These guides are made possible by a group of manufacturers working together with Digital Dots. This article is supported by HP, EFI, Fujifilm, Mimaki and Roland.